In the new TAARII Newsletter of the American Academic Research Institute in Iraq, Issue no. 3-1, spring 2008, Carrie Hritz provides more concrete evidence of the extent of looting in southern Iraq. Hritz looked only at a 600-square kilometer area centered on one site, Isin, capital of a dynasty that ruled Babylonia from around 1100 -1000 BC. She was able to obtain time-series data for winters of 2002, 2003, and 2006, as well as from the mid-1990s, for this area. The good news: the imagery revealed sixty additional possible archaeological sites beyond the 56 that had been identified through ground surveys. The bad news: "site looting was widespread, and it increased between 2002 and 2006." On the site of Isin itself, "the 1960s and 1990s imagery does not show any visible looting damage. But in 2003, distinctive round lootingholes appear covering 37 hectares of the site. By 2006, looter holes expanded to cover 69 of the 193 hectares, more than doubling the area of damage within this three year span." (That would make for an annual rate of roughly 7% between 2003 and 2006, just slightly less than the 10% that archaeologists had been estimating for the country as a whole.) Many of these holes are on the newly detected sites, which means those pristine sites have been forever despoiled and whatever contextual information they might have yielded is probably gone forever as well. "Sites never visited by archaeological survey are subject to the same rates of looting as those known from archaeological survey." So let me see if I have this straight: the 8 sites in southern Iraq which were found to be largely unlooted are completely anomalous and it is intellectually dishonest to infer anything from them about the level of looting in the country; whereas, the case study of a single area damaged by looting can be extrapolated out into broad claims and estimations of how much damage is being done to sites throughout the country on a yearly basis--does that about sum it up? On a positive note, the use of GIS to identify previously undetected sites is fantastically interesting. Let's hope that the looters (many of whom obviously have access to Google Earth) don't catch on to this tool before the sites have been secured. No, you do not have it straight. 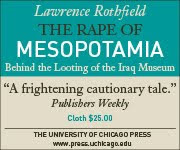 What the Hritz study shows is that there has been looting in southern Iraq -- counter to what the article in the Art Newspaper says (and note, it is the Art Newspaper, not the archaeologists they quote, who do the extrapolating). This is not to say that there may not be other sites that have not been looted; it is only to say that we know extrapolating zero looting is just plain wrong. Hritz also provides the first irrefutable evidence for what the rate of looting in at least one area was during the period 2003-2006. We do not have to estimate, for this area at least. We know for a fact. And the fact is not a happy one. The larger point is that, while it is possible to quibble about just how much damage Iraq's sites have suffered, it is intellectually dishonest to suggest as the Art Newspaper account does that because nothing happened at 8 sites nothing has happened elsewhere, either in southern Iraq or in other provinces. The looting is a reality, and the loss to our knowledge of our origins has been substantial.